What is WhatsApp Gold? And why are users paying for this ‘secret’ app with pro features? If you have been invited to join a paid-for variation of WhatsApp – dubbed WhatsApp Gold – do NOT be fooled.WhatsApp Gold is part of a new scam circulating online. The aim of the hack is to trick users into downloading a secret upgrade “designed for celebs” called WhatsApp Gold. This update claims to include a swathe of advanced features, including video calls (rumoured to hit the official version of the app in the near future), the ability to delete messages you regret sending (something this WhatsApp rival has already mastered) and the ability to send more than 100 pictures at once. 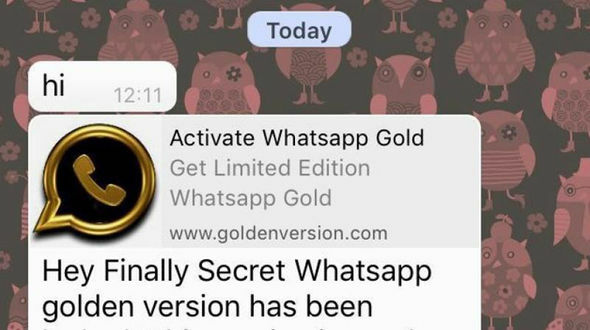 It’s unclear how many WhatsApp users, who recently gained the ability to send bold and italic text in the official app, have been targeted by the scam.One version of the scam message reads: “Hey Finally Secret WhatsApp golden version has been leaked. WhatsApp users are then asked to click on a link to download the update, which in reality just takes them through to a website believed to be laced with malicious software.If you get any messages about upgrading your account or app to WhatsApp Gold – delete them immediately. The news comes days after iPhone owners received spam text messages that claimed to be from Apple and warned about iCloud accounts expiring in the coming days.